Cliqtalk is a very flexible collaboration solution designed for project teams, student groups, communities, and organizations. The system enables users to follow, initiate and engage in conversations, and vote on topics. With Cliqtalk, users can keep their media (photos, videos, documents) in their preferred cloud storage systems, like Google Drive, Dropbox, and Box, and share them in the topics they follow. In its role of a teamwork and community assistant, Cliqtalk is the ideal solution for organizations and communities, entrepreneurs that converse about innovative products, non-profits looking to assemble and engage donors, news reporters that work on shared articles, and all student teams looking to exchange information and submit reports. 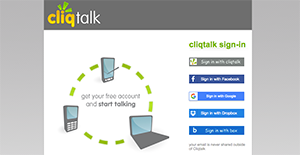 Cliqtalk offers accessibility using your mobile devices, tablets, and laptops. The system can also be accessed via your favorite browser or through the Cliqtalk app. Users can limit topic access based on their locality and set up notifications for real time updates such as new posts via email or mobile text (SMS). Cliqtalk provides businesses and organizations with a mobile-first secure solution to share and access collective knowledge within the internal structure. The platform makes it easy for users to identify common interests that are significant to the organization’s business. Users can read and post messages, exchange private messages, or vote on issues in ongoing discussions. The system offers a variety of unique functionalities, including the possibility to get dedicated mailboxes for each topic, and initiate conversations on forum topics and blogs. Making decisions will also be facilitated, as you can forget about lengthy conversations, and engage users in open pools where they can cast a vote right away. Meanwhile, you can arrange tasks in neat to-do lists and assign them to your team members, making sure that they all have access to the particularities of the common project. If you’re in charge of a non-profit project, Cliqtalk will share news, attract and engage donors, the same way it assists corporations promote their work on social media. Another distinctive advantage of this system compared to similar collaboration assets is that it builds an efficient and searchable repository of conversations about all project ideas, concerns, and their resolution, and lets you pull off valuable data at any point of time. To make matters even better, users are always in full control of this system. They can easily follow or unfollow a topic without having to submit requests. Topics can be listed and made visible to all. They can also be set not to appear on the list and to be seen only by users who know the topic’s name. For added security, topics can be limited to those who have an invitation to view them. Users also decide at their own discretion whether to follow or stop following a topic. No special request is required. Topics can be listed (visible to all), delisted (accessed only by those who know the topic’s name), or secure (access is by invitation). A company can customize a private Cliqtalk site with their branding elements such as themes and logo so that topic followers have the perception that they are navigating a company’s domain when they engage in topic discussions. Sharing web-stored media is also a breeze through attached links in Cliqtalk posts. Cliqtalk alerts on new posts can be specified by the user and are available in the form of email alerts or mobile text alerts. What Problems Will Cliqtalk Solve? Michael, a staff member in the organization has a question on his current project. He searches for Cliqtalk topics that address similar issues and finds a few relevant topics that he decides to follow. Within these followed topics, Michael can use Cliqtalk search facilities to find relevant talks. Alternatively, he can post a question. In a converse topic this is a public post, and in a report topic, his question is a comment to a report’s post. Any reply to the question will be a public post (in a converse topic) or a comment (in a report topic). If Michael does not want his question posted for all to see, he can opt to send a private message to specific topic followers. He can see who are the other followers by selecting the option, chat privately, and choose among these one or more followers to whom he sends a private message. Any reply to the question will be sent privately to Michael as well. Jennifer, a staff member in the organization’s R&D department has an idea about a new project. To check her idea she creates a secure topic about the new project where only invited users can read and post. Jennifer invites selected co-workers to follow her topic by selecting the option set converse topics (or set report topics) and then invite users to follow. The sent invitations are Cliqtalk instant messages sent to her co-workers. A user that replies to a sent invitation will automatically join the clique of topic followers. Jennifer can see who is following her topic by selecting the option clique. She is assured that only invited users have access to this topic’s posts. David, a staff member of the organization’s internal services department wants to poll staff members on a new service the organization is planning to adopt. David creates a new converse topic where he can invite staff members to post their opinion on the service. After some discussion, David can post in the topic a talk asking the organization’s staff to cast their vote on the service. The vote results, displayed in a vote talk, will indicate how many voted for, how many against, and how many remained neutral. This will allow the organization to assess how valuable is the new service offering. It's essential to realize that almost no app in the Collaboration Software category will be a perfect solution that can match all the needs of different business types, sizes and industries. It may be a good idea to read a few Cliqtalk reviews first as some solutions may dominate exclusively in a really narrow group of applications or be prepared with a very specific industry in mind. Others can function with an idea of being easy and intuitive and consequently lack complicated elements welcomed by more experienced users. You can also come across software that focus on a large group of users and offer a rich feature base, but that usually comes at a higher price of such a service. Ensure you're aware of your requirements so that you choose a solution that offers all the features you look for. How Much Does Cliqtalk Cost? We realize that when you make a decision to buy Collaboration Software it’s important not only to see how experts evaluate it in their reviews, but also to find out if the real people and companies that buy it are actually satisfied with the product. That’s why we’ve created our behavior-based Customer Satisfaction Algorithm™ that gathers customer reviews, comments and Cliqtalk reviews across a wide range of social media sites. The data is then presented in an easy to digest form showing how many people had positive and negative experience with Cliqtalk. With that information at hand you should be equipped to make an informed buying decision that you won’t regret. What are Cliqtalk pricing details? What integrations are available for Cliqtalk? If you need more information about Cliqtalk or you simply have a question let us know what you need and we’ll forward your request directly to the vendor.